Can You Make A Few More Calls? We’re getting to the finish line, but could still use some help getting the Legislature to keep our ferries toll free. Here’s where things stand now. The House passed a budget plan that wouldn’t add taxes to the Pamlico and Neuse River ferries (but would keep the ones already in place.) The Senate passed a budget that slaps a toll on every ferry route in NC. Now the two chambers have sent representatives to a Conference Committee to sort out these (and many other) differences they have between the two budgets. Click here to find the list of Conference Committee members you can call and email. Even if you get their voice mail, just deliver your simple message: that for so many reasons, the House plan for the ferries is the best. One House Committee has approved House Bill 475 – House Transportation gave its okay to the bill that would look for other ways to raise money for the ferry system in place of adding tolls. Now House Bill 475 goes to the House Finance Committee, where there could be a vote as early as Tuesday, June 4. HB475. HB475. HB475. HB475. HB475. House Bill 475 is our last chance to fend off the ferry tolls on the Minnesott-Cherry Branch and Aurora-Bayview ferries. Call the House Transportation Committee now — yes, really, now — in advance of their vote on Tuesday May 21. You can read HB475 here, just as it was introduced in to the Legislature this spring. Here’s what it proposes: that none – zero – of the seven ferry routes in our state should be tolled. That may seem an audacious approach… but think about it. HB475 sees ferries not as something to be tolled, but as an economic development tool for Eastern North Carolina. Make it easier – and cheaper – for people to get from point A to point B and they will go there and spend their money on tourism, shopping and other things. The state could even pull in more money through sales tax on those items and services than it could make by tolling a few ferries as is the current plan. House Bill 475 has to be approved by the Transportation Committee on Tuesday. That’s the focus now. Or more to the point, the focus is on the members of that House Transportation Committee. Give them a call — leave a message. Or at the very least, send them an email You’ll find their phone numbers and easy email links in How You Can Help Now. A wonderfully ironic consequence of bad legislation (and the NC General Assembly’s ferry toll legislation is really bad) is that it inspires people to work very hard to find a better solution. It forces us to question issues that we have in the past taken for granted. For instance, this question: If ferry tolls are bad to impose on the commuter ferries, are they also bad for the three ferries already being tolled? Read More – the complete article is at this link. On the Neuse and Pamlico Rivers, the ferry routes are our highways. We take them to our jobs, to school, to business appointments, doctors visits, to visit family, to run errands. Now those ferry routes — our highways — are about to become toll roads. This is from the official North Carolina 2011-2012 State Transportation Map. The words, FREE FERRY, circled in red, mark the ferry routes that are clearly part of Highway 306. 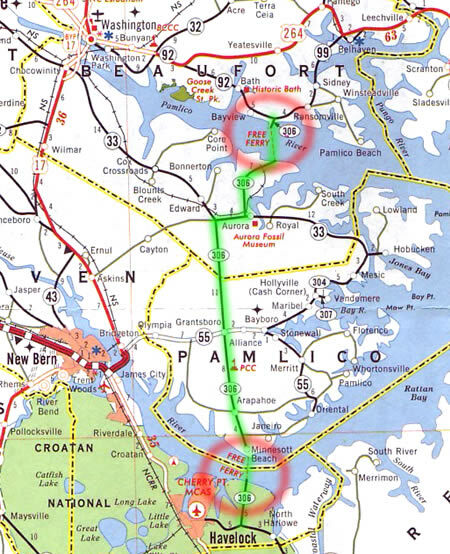 Highway 306, highlighted in green, can be seen on all shores of the ferry routes. For decades the ferries between Cherry Branch and Minnesott on the Neuse River and between Bayview and Aurora on the Pamlico River have been free, just like all the other bridges and highways in North Carolina.